This easy eggless vanilla cake cupcakes recipe no condensed milk no butter is the best Eggless Vanilla Cake / Cupcakes recipe ever!! 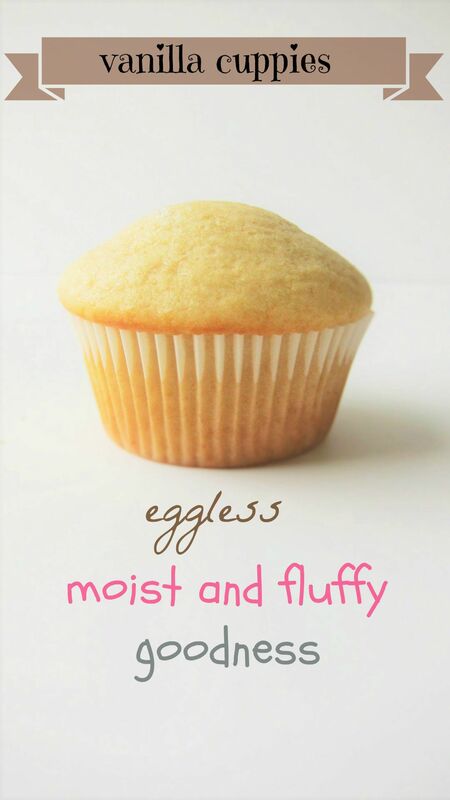 !If you like your cuppies moist , light and fluffy as a cotton ball then this recipe is for you . It’s one of my favorite eggless vanilla cupcake recipe which works great for cakes too. Makes a perfect base for filling frosting and decoration for all occasions . I am using this recipe for years now and the taste and texture of the end product – be it a cake or cupcakes is just fabulous. The best part is its absolutely simple and made with handful of ingredients easily found in every household . some were dry , some not that airy and fluffy , some were moist but dense , some fell flat on me some turned out ok but ‘ok’ isn’t good enough for me. I didn’t want to settle for something mediocre . Cakes I baked remained great the same day but eventually dried up the second day or a day after refrigerating it . You can of course warm up your slice and enjoy it in this case , but what if I had frosted ones? Can’t warm them up right. So decided to make few adjustments to the recipes which were on my like list. Good recipe turned into the best recipe & how?? I have a vanilla cake recipe saved in my folders for approx 7 years now. Honestly I don’t know who has created it . But who ever it is I am thankful to that person . I have made few adjustments to it and recreated it to suit my taste – and I want to term it as the BEST one. After making the cupcakes the original way , they were fabulous the same day but they dried up or became a bit tough the very next day and that needed to be fixed. Second thing that was bothering me was that they weren’t as light and airy as a cupcake should be . They were a bit dense ,perfect texture for a pound cake and not a cupcake. Thirdly they were a bit sweeter than what we generally prefer especially if I decide to frost them , then I like my cake to be less sweet so that after frosting the sweetness is balanced. I am more of an ingredient person than a recipe one. If I see a recipe I take it more like a guideline and try to play around with the ingredients provided I am well versed with their properties. The original recipe calls for butter . I have replaced it with oil and used some butter essence resulting into moist cupcakes even after 2 days. It was all maida / apf in the original recipe , I have replaced some with cornflour resulting light and airy texture. You can call it as home made cake flour . rest all pretty much the same. I am so glad to share this recipe with you so that you don’t have to go through all the trial and error . Hope you like it as much as we do. enjoy the step by step instructions mentioned below followed by the recipe and important notes. use blender with whipping attachment and not the beater attachment. Doesn’t matter if its a hand held or a stand mixer – both will give you same results. all ingredients have to be at room temperature or not too cold including yogurt /curd . act quickly once the batter is mixed because the leavening agents start reacting as soon as they come in contact with something acidic – here its yogurt. do not over bake – it dries out the baked goods. Always start by pre heating your oven and lining up the pans. 1) cream the yogurt and sugar until sugar is dissolved. 9) toothpick test. Once baked and out of the oven , cool it in the pan for 10 minutes then transfer it on a wired rack if you have one. 10) If you are impatient one like me , just pick 2-3 and eat them right away – warm spongy, moist and yummy . Don’t forget to save some if you desire to frost them . Moist Light and fluffy eggless vanilla cupcakes that can easily be made into a cake . Perfect for any occasion . Enjoy it with or without frosting. Preheat oven to 180C /350 f for 15 minutes. Cream the sugar and yogurt until the sugar is completely dissolved. Add vegetable oil and vanilla essence and whip well until oil is emulsified. In another bowl sift all dry ingredients and give it a quick mix. Now, slowly add sifted flour fold into the wet ingredients. Fold the dry ingredients in the wet ones with a spatula or whip it with a hand blender / stand mixer until lump free and smooth. Add water if needed. Batter should be medium consistency. Bake in preheated oven at 180 degree C /350 f for 15-18 minutes for standard size cupcakes or till a toothpick inserted into the cupcake comes out with fewer crumbs not batter. My cupcakes were done in exact 15 minutes 30 seconds. Take it out of the oven and then it Transfer onto cooling rack after 10 mins. For cake- bake 35-40 mins and toothpick test . You can substitute the apf and corn flour with wheat flour - 1 1/4 cup in total - of course there will be a variation in texture but tastes great - good options to make for your kids. use blender with whipping attachment and not the beater attachment. Doesn't matter if its a hand held or a stand mixer - both will give you same results. act quickly once the batter is mixed because the leavening agents start reacting as soon as they come in contact with something acidic - here its yogurt. do not over bake - it dries out the baked goods. you can even add almond flavoring or some lemon or orange zest. Cakes made from this recipe and not frosted keeps well at room temperature for up to 2 days and in the fridge for up to a week . If frosted, Shelf life totally depends on what frosting has been used. I just frosted and packed some for a dear friend who has invited us for dinner. Makes two 6 ” cakes or one 8 ” cake . Below is a sneak peek on what’s next week on my blog – detailed buttercream and frosting these beauties!! Hope you like this recipe and do give it a try. I would love to hear from you. Love being here , don’t miss a single recipe- Subscribe now – it’s free and get every recipe in your inbox.Subscription box is on the home page and below every recipe post.If you have tried any of my recipes do drop in a feedback in the comment section or on my Facebook page carveyourcraving in messages section or tag me @carveyourcraving on instagram. Happy cooking!Do share it with the world!Thanks for stopping by. Hello Lakshya, after measuring the granulated sugar you can pulse in the blender to powder it. I have always whipped my batter until lump free. Cut and fold method is effective too. What kind of oven do you use? Does it typically run hot? Hi Aksha, you may use a manual balloon whisk or a spatula or spoon to gently mix. If using a spoon do a cut and fold method towards the end i.e just scoop the batter and fold it back 8-10 times to incorporate air. Hope it makes sense. I read the post.. I do not have a whisk attachment.. I have blender n kneader attachments only.. can u pls suggest how I proceed further.. Tried this today and it comes out beautifull. Hi MAhua , I have many basic frosting recipes on my blog. Simple buttercream , ganache , cream cheese and whipped cream frosting too. Ganache requires no tools. Hi khushboo, thanks for the wonderful recipe of vanilla cup cake, I have never done frosting on cupcakes and neither do I have tools for it, should I go for whipped cream method, do u have any blog for it.. I’m looking for it urgently. Hi, can you please let me know if we can use powdered sugar and in what quantity instead of granulated sugar as the granules fail to dissolve when I have tried whipping it with butter or yogurt. Also at step 6 (presented with image), do I use cut and fold method or whipping attachment only as at many places I have read that at the end stage it is better to combine wet and dry ingredients by cut and fold method rather than whipping. Lastly, my cake gets cooked quickly at the top but inside it is still runny so please suggest a way which can help in ensuring that top layer does not get extremely crusty. Thank you. Hello Apple, the cake tastes great without frosting. I don’t add any extra sugar but if you like it sweet increase sugar by 2 tablespoons. Should i add more sugar to this as i wouldn’t be putting any frosting on it? If so, how much should i add? Awesome DS. Thank you for a lovely feedback . Ahhhsom!! Tried both vanilla and chocolate cakes.. Really moist and tasty..
Hello Shazia . You can make four layer cake using a 6″ pan . I use two 6″ pans to bake and then slice layers in half after cooling. This will give you a tall cake. You can bake in one 8 ” pan and slice the cake to get three layers. I do not use sugar syrup for regular buttercream or whipped cream frosting cake. If you are doing ras malai cake I suggest you brush with the ras malai milk . I am planning to use ur recipe as a base for my rasmalai cake..have few questions in mind if u can help. Which tin size should i use for the recipe n how many layers does the recipe gives. Do u soak the layers with simple sugar syrup when using it as a base for any cake if yes please mention the ration of water n sugar for the syrup. Shazia You may use 1/3 cup oil . And adjust liquid in form of milk or water. Even if you use water instead of milk the yogurt takes care of the moistness. I tried your recipe with balck current frosting n it turned out awesome… i have tried so many cupcake recipes but the cupcaker liner never comes out so neat n perfect… as it turned out with ur recipe. Taste was amazing too.. as i was worried about so much of curd in the recipe…but it was not tasting like curd or sour at all.only one question i find it to be little oily can we reduce the amount of oil used in the recipe… if so then do we have to increase the amount of liquid… to balance out the batter. Can we use milk in place 2 tbsp water. I have always stopped myself from making eggless cakes. But today i did so with your wonderful or rather magical recipe ❤… we loved it 😊… next will be the eggless chocolate one… thanks a lot for making an uphill task so easy for. Seema,Did you use unmelted butter for cupcakes ? Did you bake standard size cupcakes or mini ? It should bake at 180 deg C and did the toothpick come out clean at 15 minute? If not then the cupcakes are undone and hence sank . I use raw sugar because we like it. If you find white sugar sweet then reduce by 2 tablespoon . I took it out after 15 mins in fan based over after 175 degree to do the toothpick test. Thank you for replying. The tin i used was of 6 inch and yes the baking powder was also fresh. I have tried this recipe 3-4 times but everytime same issue. Earlier i thought may be problem with my convection microwave but this time when i tried vanilla cake ,it came out great so that should not be the cause i suppose. Thank you for reaching out Lavan. Sure let’s work it out. I am glad that vanilla cake turned out well for you. About chocolate cake I need more details from you like pan size used, was the baking soda fresh? ? Chocolate cake on my blog is the most tried recipe by all readers and is very forgiving too. I want you to get it right too so do let me know. But i tried your eggless chocolate cake recipe too (followed recipe to T again) but it got over baked (hard) from outside and uncooked from inside. Any suggestions what could be the reason as i have tried it 2-3 times earlier as well with same issue. Earlier i thought may be temp issue but after i baked the vanilla cake perfectly i dont think that should be the issue. Would really appreciate if you could help. You can cut the recipe into half. You might be left with batter of one extra cupcake . By far the best egg free recipe that I have tried. How sweet Candice. Thank you for a lovely feedback! So many positive comments encouraged me to try this cake . It was the best ever egg free cake. I made it fit my mom who has egg allergy. Still moist after 3 days. Thank you. Glad to know that Sue! Turned out amazing. Soft and delicious! That’s awesome Mahima. I would love to see it . You may either email me or send the picture as a message on my fb page CarveyourCraving.. cheers! Thanks dear..everyone at home loved the taste of the cake. big cheers to you!! want to post a pic..trying to locate it on your site. Sure Mahima , let me know if you need anything else. Good luck! Thank you dear khushbu for ur v quick reply! big help really 😊 will get back on how it goes..fingers crossed..v positive and hopeful thanks to ur advise! Double my recipe Mahima for a 12″ cake . Cake flour has baking powder and cornstarch included. So my recipe won’t work . You will have to make changes . You can bake upto 3 days in advance and store in fridge with no change in moistness of the cake.Always keep your cake covered with cling followed by foil to keep it away from drying out. Dear khushbu, have 3 queries related to your eggless vanilla cake.Im going to use wilton dinosaur shape cake pan which is 12 and 3/4 inch X 11 inch in size. The instrictipns specify 2 layer cake mix. Is that the same as doubling ur recipe? Secondly i have cake flour. how do i alter the flour measurement in ur recipe. Can i bake the cake 1 day in advance and frost it on the main day? ( going to use american buttercream frosting) Do i need to refridgerate it covered with clingwrap? Awaiting ur reply asap. my sons bday is on 26th march. Fantastic Vanda… you are on a roll! Made it twice this week with your cream cheese frosting. Definitely a keeper! Hello Deepika. Cracked top isn’t a problem as such.. it depends on oven to oven .. did you cook it for a long time? Did you let the cake cool in the pan for 10-15 minutes and gently invert on a cooling rack. Beat the oil and yogurt well until emulsified. Happy to know that this recipe turned out great for you Mridula. You can make whole wheat.. I do it all the time. They are a bit dense.. but kids love it. Just add 1-2 tablespoon more water . What is the approx width of the star shaped pan ? Tried the cupcakes today.. it was simply fabulous.. my 1 year old and 4 year old kids just couldn’t get enough of it… Looking forward to trying your chocolate cupcakes next week.. a little apprehensive of trying the whole wheat version though – any specific flour that you use ? Also if I’m using a shaped cake pan like a star how do I go with the quantity.. Thanks again for the great recipe . Can’t wait to try more of them. Thanks for the recipe.. Tried this today as a cake n it tasted awesome. However had some problem with the texture.. Not sure where I went wrong, had followed the recipe exactly as such. Except for buurt essence and that I baked in a 8” square tin. B. The texture was not very sturdy. Cake broke from the middle while taking out of the tin. C. Cake left oil in the hand while eating. Very sorry Rakhi, this message was in my spam folder. Just came across it. You just double the recipe in future for a thick sponge in 9*13 pan . Bake time would be 40-50 minutes.Check at 40 minute mark. Sorry to hear that Jesal. Was the cake cooked well in the center. What pan size did you use and did you remove the cake after it cooled down a bit or when it was still hot? What’s the measurement of one cup? I made cake using your recipe twice but u fortunately both the time the cake has fallen apartfrom the center but not all the way. The taste is good comes out soft as well. What could be the reason for it falling apart from the centre? Hello Jai, please elaborate on assistance you need. I wanted to make a 12inch cake using this recipe. Can you help with this? Thank you Vanya! I am happy that you got great results here. Do try other bakes too. Hope you love them too. Oh Khushboo! This recipe is genius. Tried many before , but this is great even without cornflour. Can’t wait to try other cake recipes. Thank you! Hello Uma, I was off blogging for months now. I will try to put the recipe in grams soon. The liquid ingredients are measured in a spout cup made of glass or plastic. It’s one tall mug with mls on one side and cup measures on another. For dry ingredients , the cups are individually marked and sized as 1 cup , 1/2 cup and so on. Hello Sonam, cracked tops aren’t an issue as such. It all depends on oven to oven and make sure that the sugar is completely dissolved in the liquid. Do not over bake your cupcakes! Pumpkin spiced cake sounds yum! I am so happy that you love this recipe Tina. Thank you for a great feedback! Tiramisu .. yumm yumm .. sounds delish! Glad it turned out awesome Sapna! Hello Khushboo.. I had planned long ago but finally got time to bake. Could U please help me with the recipe in grams? I read all the comments. And I do not have wet ingredient measuring cups. Would be great if U could help me with the same. I tried the cuppies….but tey happen to have cracky surface ten plain surface!!! Any tricks for the same plz. Thank you Shraddha, I will soon update the recipe in grams. The measuring cup that looks like a mug with a spout is used to measure liquids and the individual measuring cups that you get are used to measure dry ingredients. I won’t suggest altering this recipe with your mentioned ingredients as it will require altering sweetness as crush is sweet, alter liquid as well as rising agents. For orange flavoured cupcakes, can I add 1/4 th cup orange crush, 1 tsp orange essence and orange peel? Or instead of peel should it be orange rind? Hi Khushboo….first of all I want to say thank you for all your superb recipes….they are just great. One doubt though, u have mentioned in one of your comments that we are supposed to weigh dry ingredients with the dry ingredient cup and the wet with the wet ingredient weighing cup. I would like to know the difference between the both. And where can we get it ? It would be very helpful if you could update the same recipe in grams……thanks a lot…. Mallika , always use dry measuring cups for dry ingredients and the liquid cup for wet ingredients. At present I haven’t noted the ingredients in weight. Will update soon . Hello Bhuvaneswari. I am glad you liked the chocolate cake recipe. I think for 1 kg finished cake with frosting you will have to double up the recipe . I am not quiet sure though as I have never weighed the final cake. The cupcakes being sticky on the top isn’t a problem as such. This is because you have moist and soft cupcakes from inside or even humidity outside makes them sticky on the top. We usually frost them on the top. If the sticky ones bother you then simply dust the top of each cupcake lightly with cornflour . Yes you can Vanessa. Just substitute the all purpose as well as cornflour totally with cake flour. Thank you Valerie . For this recipe add 1 tablespoon lemon zest to the dry ingredients and 1.5 tablespoon lemon juice . reduce yogurt by 1/4 cup and substitute it with milk . Your eggless vanilla cake is YUM!! As per your suggestion, how much lemon juice or lemon zest or lemon essence would you add to make this an eggless lemon cake? Hello Sonal, I am happy to know that both the basic recipes worked for you, have a nice day! My pleasure Isha , I am glad you enjoyed both the versions . Thank you for a lovely feedback . Hi Khushboo! Thanks for sharing such a brilliant recipe!! I tried both cake and cupcakes and loved them all! They were super soft and super yummy! Khushboo , thanks for sharing d recipe.My cupcakes turned out yummy, though it was my first attempt.Even the chocolate cupcakes I tried were awesome. Hi Khushboo your recipes are amazing. I tried your chocolate cupcakes recipe and they turned out yummy. I want to try this one too. My friend wanted a one kg vanilla cream cake. Can i use this recipe to make 1 kg vanilla cream cake. Please suggest. One more question when I made the chocolate cupcakes and I kept them at room temperature they became sticky at the top, please advise where I went wrong? Thanks. This sounds great! Will be making these for my 3 year old’s birthday party. Can I use cake flour instead of all-purpose? Ph thanks, i was reading the comments and got the answer. What can i replace yogurt with to make it vegan?? I am glad you think that way Sweety. Happy baking!Thank you! Can we add tutti fruiti & nuts to same recipe to make a fruit & nut cake? Or will it change the proportions? Thank you for a wonderful feedback Shreya. I am glad you are enjoying these easy recipes! Wow​… Your​ 2nd recipe which I tried and it was perfect to T. 1st one was chocolate cake. Gives me confidence to try more cakes from your blog. Bhawana, vanilla cake top is not white, it will be a bit tan. And browning depends on oven to oven . It just have to be well cooked from inside . Use only lower heating element for baking cakes. Hey Thanx for the recipe..I have a query..I hvnt tried this recipe yet but have tried almost same recipe..my cake never comes out white..it turns brown every time..what am I doing wrong? We have to use both upper and lower rods for baking right.and one more query.what if I half the ingredients?do I need to change the baking time?plz help me out. Nisha , refer to my eggless / vegan strawberry cake recipe for the same ! Esha the cake sounds absolutely delicious. Thank you for sharing your lovely feedback with us! Fabulous recipe!! I have been looking for a good versatile white cake eggless recipe for soooo long and I this one was so perfect, rose beautifully, flat top, tastes insanely good!!! In order to get a nice white (and not brownish) cake, I used Icing sugar instead of regular sugar, half butter half oil and since I only had a pineapple melon flavored store bought yoghurt at home, I used that. I baked in my 7″ round tin, for about 40mins and frosted and filled with chocolate ganache. It tastes divine 😊😊 thank you so so much again for sharing this wonderful recipe. Yes you can Seema , the cupcakes will be moist but a little more sour. Hey Khusboo, can I substitute curd with sour cream”? Hello Ranjani, Different ingredients weigh differently in grams. You may put the batter in the fridge in the coolest section for up to 2 hours . Add an extra pinch of soda before baking & Bake that batch 1-2 minutes longer . I have a couple of queries! It might be silly, but I’m just a novice in baking. So, please bear with me. *1 cup equals how many grams? * As per your instructions, the batter should be immediately spooned into the tins/cups & baked. But, I have only 8 muffin cup moulds. If I want more than 8 muffins (the recipe too is for more), how do I go about it? Can I rest the batter till the first batch is done & cooled? Please reply ASAP so that I can try this out at the earliest. You may ask any question Maria, do not be sorry. Honestly I love the ones with oil and not butter as they keep moist for 3-4 days. Test both ways and see what you prefer. Do let me know the results. Happy baking! Hello Maria, the butter extract or essence is just to get buttery flavor. It doesn’t anything to the moistness of the cake. Just ignore . You may use half oil and half melted cooled butter . Thank you! Hi, I am planning to make these for a party this weekend. As I couldn’t find any butter essense from the local supermarket (I live in Australia), can I use butter instead, without compensating on the moistness of the cake? If so, how much butter do I need to use? Alternatively, can I go part oil and part butter? Malka I have never used oven with a fan. You may refer to the oven manual. Generally for bakes you use only the lower heating element . Good Luck! ..I just bought a new otg .please tell me when I will go to bake these cupcakes in otg .what mode should I choose .upper or lower both temperature with fan or please guide me. Bhavika it’s 1 cup plus additional 5 tablespoons maida/ all purpose flour. And baking powder is 1 teaspoon plus a pinch that is half of 1/4 teaspoon . I will be doing butterscotch cake next month . You need butterscotch essence that you can use in this vanilla cake batter. Layer with whipped cream and homemade butterscotch . Hi dear i am going try your recipe but i am little bit confuse between measurement of apf 1cup plus 5 tbsp and baking powder measurement.please explain it in easy way. I tried the vanilla cake n it tastes awesome…. Just wanted to know how to make butterscotch cake? Please pour in your suggestions. Thank you Alex. I make them vegan too. Just sub yogurt with a dairy free alternative yogurt like soy or almond. Add 1 tablespoon of vinegar/ lemon juice to the recipe and use raw sugar. Incidentally, what would make a good vegan substitute for the yoghurt? Hello Kritika, glad you liked the recipe. Moistness depends on the weather outside too . If it’s hot and humid the cupcake tops will be moist. We generally frost the cupcakes so the moistness isn’t visible. Moist cakes are good right.. dry ones are such a turn off. You may dust the tops of cupcakes with cornflour before storing. It will help . Absolutely fantastic recipe. Loved the way the cake turned out, so soft and tasty. The salt addition gives it a kick. One query though: On the second day, the cake got a bit more moist, I mean I could feel the cake too be a bit sticky. Is it because of the curd and oil? How can I ensure that it does not get this moist the second day? Should I reduce the amount of curd I use? Sounds good Chitra. Thank you for a lovely feedback. Thanks for replying back so early.I baked both eggless vanilla n chocolate cakes.Vanilla cake weighed a little less than 650 grams and chocolate around 750grams.Both came out well. Hello Chitra, I have never weighed the cake after baking. In United States mostly it’s sold on per serving size. But I assume the sponge will be a little more than 1/2 kg and the final product depends on how many layers and which frosting , decoration used. Mostly it should come upto 800- 900 grams . It’s a very nice and easy recipe.Would like to know how much does the final cake weighs after baking?Does the weight of all ingredients added up will remain same after baking?I am also planning to make your eggless chocolate cake recipe to make chocolate vanilla cake.Could you please tell weight of eggless chocolate cake as well? Happy to know this Jai. Yes absolutely you can make it into a cake. This is my go to vanilla cake recipe. And yes you can use gel colors. Do send me the pictures of the rainbow cake on my fb page. Would love to see it. I use this recipe for the cupcakes and they came out so lovely and soft. Can i turn this into a cake? i wanted to make a rainbow cake. Will the gel colouring be ok to use? Happy to know that it turned out as you expected Sachi. Turned out wonderful. So moist and fluffy. Beats the bakeries. My family loved it. Thanks. I am glad Dipti that this recipe brought smiles 🙂 Yes you can sub the maida with aata. The texture as you know will be a bit dense that’s it . Add a tablespoon water if needed. I make it for my son this way. Baked it for my husband’s birthday yesterday and made it into a fresh fruit cake. I used pineapple essence instead of butter essence and realised that the store brought cakes had that flavouring….my husband found the childhood taste that he likes and loved it ? One question though, I generally bake with whole wheat, could I just replace maida for aata in this recipe or would it need more adjustments? Cornflour makes your cakes lighter with a tender crumb. Store in a airtight container or cardboard box at room temperature in a cool dry place up to 3 days or a week in the fridge. Moist top is natural as it is soft and moist inside. Hi Khushboo love your recipes !! Have 2 quick question s..Y do V add corn flour in the recipe?? And once the cake is baked and cooled how to store it? It generally takes moisture?? Thank you. Yes you may add a cup , maximum 1.5 cups . Dust berries with flour before adding so that they do not sink . Could I add fresh blueberries to the batter? Hello, have you tried this recipe with a 1:1 gluten free flour? I am willing to try and experiment, but would be awesome to know if you’ve tried successfully! Can we uae greek yogurt in this receipe. Hey Kavyaa , I haven’t used this oven but I hope to help you out here . Go through the manual of the oven . It is important to know what setting is appropriate for your bake. You might want to have a look at this link http://www.which.co.uk/reviews/built-in-ovens/article/oven-symbols-and-controls . Get an oven thermometer too. I would bake with fan button on or lower element and the fan button on for cakes / cupcakes. the temp 160 deg C for fan oven . Try my chocolate cake recipe . It’s an easy one. And do revert after experimenting. Good luck ! Hi Khushboo! I am a beginner when it comes to baking cakes. So far, most of them have turned weird looking- too dry, too burnt, sunken in the centre, too sweet, too moist, too eggy, etc. I have an European oven that resembles the one in the photo. Could you help me understand the symbols and the optimum setting to bake a cake/cupcake? I will soon do cakes again and lemon cake is on my list. Glad to know that the cupcakes turned out perfect for you. Lemon cake requires alteration of course. The amount of baking powder /soda will change with the acid in lemon. Hi Khusboo… loved your recipe. Cupcakes turned out just perfect. I now want to try on lemon cupcakes. Can I just make changes in this recipe like adding lemon juice and lemon zest or does it require a different recipe? Hello Iki , I would suggest separate cups for optimum results. But this recipe is very forgiving so you may try using the cups you have. Also, is store bought yogurt ok to use? Any specific type of brand? Hi, Can you please clarify for butter essence? Can I replace it with something else or just melted butter? Hi . Ihave cups measuring 200ml for one cup . So can i use this cup for dry ing. And wet ing . Yayyyy to that Shikha , I am happy that you loved it. Thank you for a lovely feedback. Hi Khushboo, I tried your recipe and it turned out great…just live the texture and taste. Now this recipe is added permanently into my recipe book. Thanks a lot ?? Plain flour , maida , bleached/ unbleached white flour are some of the names of all purpose flour. Hi, your recipe looks good. What I’d the UK equivalent if all purpose flour? Hi Shweta , use the liquid measuring cups for liquid and dry measuring cups for dry ingredients like flour . 237 ml is one cup measure for dry ingredients that I have, you can use 240 ml one. And liquid measure is 250 ml a cup. I am humbled Ami, thank you for taking out your precious time and giving a lovely feedback.Thanks! This is by far the best eggless recipe EVER! I am a passionate baker and cake designer and usually in search for perfect recipes for my cake projects. Eggless Cakes are not so easy to perfect. Specially when people usually demand a bakery like soft cake (not knowing all the artificial leaveners the bakeries use) This cake has the perfect crumb and texture, Recipe is great for layered cakes or cupcakes. Thanks a lot for posting this one. Worked out great for me. Hello again Maj Prachi, When in India I do make it in microwave on convection mode and never had a hard crust. Mine gets done at 14-5 minute mark for standard size cupcakes. May be try covring cupcakes loosely with foil mid way while baking, hope that makes a difference. Do follow up. Hello Lakshmi , Standard cup used for baking purposes. Dry measuring cups for dry ingredients and liquid measuring cup for liquids. Thanks a lot to take time to write back. Well let me tell you I use my convection microwave to bake cakes. The curd I used was a little sour. But quantities mentioned were perfectly matched. Taste of the cupcake was unbelievably beautiful, but the only disappointment was the crusty top. Tried ur recipe twice already, but the same problem. Sad me! Will keep trying ur recipe till I make perfect cupcakes. I have preheated the oven to 180 and kept the cup for 18 mins. Also would like to know, if I wanna add chocolate or any other flavour do I need to increase or decrease anything in specific ? I know, I am acting a little dumb, but trust me, I need things to be perfect. And ur recipe was loved and relished by love of my life, my daughter. Let me know, if I could do something to make the cupcake crust free. Oh ok , do you switch on both heat elements? I am trying to figure out why your cupcakes are crusty on top. I baked only till the toothpick came out clean. Hello Prachi , did you over bake the cupcakes? the crust has to be soft , and it softens more after cooling. Thanks a lot for the recipe. The cupcakes were perfect. I simply loved them. However, my crust is just a little hard on the top. I could scrap it out, but still is there something I am doing wrong. I am following ur recipe to the T.
Loads of love and wishes to make baking so easy. Yes Ambika you can double or triple this recipe . Oh nooo, yeah we all have bad days, may be you got nervous or so 🙂 , do send over cupcakes to your client again to make it up . Glad you like this recipe . Never stop trying. Hugs! Hi khushoo…thanx for eggless recipes as i m vegetarian…i tried ur chocolate Cake recipe..it was perfect…but i tried ur vanilla cake recipe with one of my customer….n she complained of very soft cupcakes as she could not remove the liner from cupcake…it breaks into pieces…..why is it so..? I used everything fresh…i did a little variation with choco chip…and my cupcakes were lil yellow not white…i was disappointed after her feedback…plz help…and also complained change of color of cupcake to green after two days…pllzzz help..
Hello Saroj, Did you add extra liquid with the cocoa too? I haven’t tried to modify this recipe yet to make chocolate cupcakes or a cake. If you wish to make one, head over to my chocolate cake recipe and it won’t disappoint you for sure. The vanilla cupcakes came out good. But for about next half of teh batter I added 2 tbsps of cocoa powder and thought to make chocohe cupcales but got burnt in the 7th minute only. Any reason why? Lol , glad to help .. yes just double it . So, i simply double everything even the time for baking! Hey Khushboo.. I tried this with your chocolate Ganache recipe and needless to say it was perfect. Thank you so much… It’s like you are my hero.. I am a little chef for my family now? but I wanted to know what changes do I need to make if I want to double the recipe. Thank you sooooooooooooo much. Awesome!!! Loved it Substituted oil with butter.. Toooo soft..
Nice to know that Sapna 🙂 thanks for stopping by. Came out great, Loved it! Glad to know that Sneha. Yes you can , use tinned pineapples dusted in flour so that they do not sink to the bottom of the pan. Hello Khushbo, I have made this cake many times and it has turned out to be perfect every time. I was wondering if I can replace vanilla essence with pineapple essence and can I put small pineapple pieces in cake batter? Hi khusboo, amazing cake.. I tried this cakes lots of times taste is amazing but It seem bit oily, is it possible to reduce oil in cake .. I have double the recipe I made in 2 8″ cake tins my cake sinks in the middle I don’t know why. My leaving agents are recently bought..
Can you please give recipe in grams..
Hi Misha , thanks for a lovely feedback. In vanilla cake recipe I have used thick curd eliminating lot of liquid. And chocolate cake has milk and vinegar which is buttermilk . Both recipes were developed at different times 🙂 So whatever experiment clicked for me I shared it that way . Hi khushboo.. I tried this recipe recently and it was perfect. Finally I got one vanilla cupcake recipe which is delicious and easy to make. Can you tell me what difference does it make if we make ‘cake batter with curd ( as in this recipe)’ in comparison to ‘ cake batter with milk and vinegar (in your chocolate cake recipe)’. Thank you again for the awesome recipes on your blog. Wow Anu , that’s great. Happy to know that this recipe is a staple at your place, happy baking! Hi Khushboo , thank you for such a perfect recipe. It’s a winner. I am a professional baker and my clients love the cakes I make with this one. I owe you big time. Thanks a lot! Hello Emily.Such a bummer , lets find the possible reasons here. Before inverting the cake, did you loosen the sides. Take cake off the pan 10 minutes after taking it out of the oven . Did you line the base with a parchment? I do that always. Hi! I love this recipe I made it with the cupcakes. But when I did it with the cake I had a hard time getting it out and it broke into pieces and some stuck to the pan. I did grease the pan with butter and flour. Not sure if I should’ve sprayed Pam Instead or let it cool longer. Was wondering what you thought. So happy to know this Rakhshan . Thank you for a lovely feedback. I stock it up from online and in store both. Craft stores like jo anns , michaels and online from wilton , amazon , e bay for boxes . I will soon do a post on baking essentials . I use organic unsalted butter for buttercream. Santhini ,glad you found what you were looking for . May I know whether or not you have used liquid measuring cup for liquids and measured to the T? And are the liners good quality, sometimes liners come in terrible quality. It shouldn’t ooze out oil , can you try it again reducing oil by 1 tablespoon and adding 1 tablespoon other liquid and give a feedback . Thanks. Hi..i was lookin for some eggless cupcakes receipes and i stumbled upon your blog and m glad i did it..i really lykd it..
Wanna try these baking receipes. Hello Aditi , I am sorry this happened. As you see the comments , it has been tried and tested by so many readers. Let’s work it out here. Are you sure you followed the measures to the T. Sometimes it happens that we go overboard. Do follow up. Did it rise? were the leaveners used in a good condition? Thank you for reaching out, I have updated the post regarding storage. You always bake previous day and decorate next day. This helps flavors to deepen and work easy on the cake . Check out my tips on frosting a cake and storing on my salted caramel death by chocolate cake post. I would store the cake at room temperature in a cool dry place covered for up to 2 days .Hope this helped. Hi … your cupcakes just seem awesome..!!!! … i wanted to try these in two layer cake for my daughter’s birthday.. I was looking for egg less cupcakes recipes for months now. I have tried almost all recipes available, Nothing tasted so good so far . I found your blog just yesterday when i was searching again :), I tried the recipe, the cake tasted awesome, It was moist, soft texture. I have some queries related to that, i too baked it for 15 min, used the measuring cups for all ingredients . yes you can , I do it all the time for my son. But keep in mind the texture changes a bit whenever you use whole wheat. Mix it lightly . Do not overmix. If you like healthy bakes do try my other recipes – healthy brownies and muffins too. Thanks for the tip.I’ll definitely try. Can I replace maida with whole wheat flour? I am so elated to know this Sandhya. You can surely add nuts to it. Dust it with flour before you fold it with the batter. Have you tried my eggless chocolate cake. It’s the most popular recipe of my blog tried and tested by hundred’s of readers .I am sure you will love it too. How could I postc without rating! Here it is ..
My search for soft eggless cake ended today. I followed your recipe to the T except for omitting butter essence. The cup cakes came out super soft. For our taste, it was a little high on sugar, which I’ll reduce next time. I have a small oven and can only bake 6 cup cakes at a time, so was worried whether the cup cakes from second batch may not be as soft, but thankfully they were as soft as the earlier ones. I’m now going to try this in a cake mould. If I want to add cocoa powder and nuts, how much can I add without changing the proportions of other ingredients. Also, I’d like to use wheat flour instead of maida. Would the proportionsof ingredients need to be modified? A big thanks for researching for the perfect recipe and for sharing it. I’m now going to be a regular visitor to your blog. Hi Saroj , you can add tutti frutti , nuts, choco chips and chopped fruits to this recipe . But the sauces will change liquid and sugar proportion. Hi Surbhi, that is called sweating of cupcakes. You need to take them out of the pan after 10 minutes of baking or the steam gets trapped and moisture develops. Hope this tip helps . Thanks for writing. hi…made vanilla cupcakes…taste was good but i faced one problem…the lower part was too moist even after baking it for 18-20 minutes….and i baked at night and kept it to cool and removed from the silicon cupcake mould in the morning….what could be the problem as i gave it ample time to cool…. What a fantastic recipe. I made it and it was perfect and easy in every sense . Omg just too good . Thank you Khushboo . My search for a perfect vanilla cake has ended. I have another query this time! The curd i have is sour. Is it fine to use? Hi Khushboo, firstly thanks for lovely eggless baking recipes, as I am always on the lookout for these. I tried your eggless vanilla cake recipe, and followed all the measurements as mentioned. However, The cake which came out was too oily, I tried absorbing some with paper towels, but even after using 4-5 towels, which were completely drenched with oil, the cake looked oily. I was not able to frost it, as it just crumbled down into small pieces. Could you please guide me why this must have happened? I haven’t weighed the final product yet . Here it’s sold serving wise . Hi , I suggest you use my mango cake recipe as altering this cake with mango puree will change sugar and liquid quantity. Yes , I always do . Thank you Khushboo !! I am going to double the ingredients. Should I double the quantity of baking powder and soda too? Hi Anusha . Whipping means incorporating air in the batter for fluffy spongy cakes. Beater won’t give that texture. You can gently fold the dry and wet ingredients with a spatula until lumpfree and not overmix it. or you can use hand held balloon whisk . Hi Navi , This recipe can be successfully doubled . I do it all the time using one 9 ” pan. Double the recipe with cooking time 35-40 minutes. Want to bake this again but as a cake and a bigger one. What measurements should I change to double or almost double the size? My cake tin would be 9.5” round. Will wait for you reply. Thank you so much!!! Hi khushboo i don’t have blender with whipping attachment as u shown in the pic,i have blender with beating attachment so u strictly mentioned not to use this attachment,will it change the texture of the cake of i use this beating attachment, am very new to bakIng so am bit confused pls help me out. Yes I do have a page 🙂 and it’s mentioned at the end of every post 🙂 sure do. Do you have a page of your website on Facebook? I wasn’t aware of that though? Thank you for reaching out Komal. May I know how are you storing the cupcakes. Give cupcakes 20 minute stand time if siting in the fridge before consuming . That is sweet of you. I did see and comment on your post. Happy to know that you made changes according to your preference. Thank you for a lovely feedback:) keep baking lovely goodies! You can send me a picture on my facebook page message section. I would love to publish it. Thank you for your feedback Rashmi. Yes you can bake a cake with that recipe . The cake will take 30-40 minutes baking depending on pan size. The details are mentioned in the post. Thank you for your feedback Chaku. Vanilla cupcakes are light airy and spongy.I am sorry if it did not work for you. How long did you bake it for? Did you check the effectiveness of your leaveners . Did you overmix ? Try substituting cornflour with maida itself and compare the results. I also tried vanilla cup cakes.. They were not spongy though taste was good and they were super moist and soft but i think they were too soft texture was like frozen suiji Halwa. So can you tell me what can be mistaken or how to make them spongy? Namrata , at present I don’t have the measures for this one in grams. But request noted. I have always made this cake using measuring cups and spoons and it comes out perfect.Glad you like the cake recipes.This one will work for you as well. Can you please tell me how much is 1 cup apf/maida in gms in this recipe? Is it 130 gms? Also sugar in gms? Thank you Anusha for a nice feedback. I strongly suggest lining your pan with parchment paper and dusting it well. Also whenever you are using nuts , dust them with flour and then fold in the batter to avoid them sinking in the bottom . Hi khusbhoo,i found ur blog today as i was seaching for best vanilla cake,so ur recipe didn’t had butter as i hatw it so imm i tried it today n i had a small problem with it as my cake got stuck to the bottom when i tried to remove it it bottom of the cake didn’t come properly as my 3.5 years son love dry fruits i just added few raisins n cashews is that sticking is coz of adding dry fruits no idea pls tell me wr i went wrong,but the taste was heaven n upper side of the cake was too good n just loved it n bookmarked it as i will bake it again n again n my my cake got finishes in ine go my son n husband loved it all thanks to u n subscribed to ur blog,kudos to u dear khushboo. Hey Tripti , this is a fantastic question and many readers ask me too :). The fact is more you whip more tough the batter will get. It will develop gluten which will result into tough dense cake. Batter doesn’t require a lot of whipping to fill in air, whip until lump free . A lot of batters call for gently folding in too. So more you whip more stiff your outcome will be. Hope it helped. Add pineapple essence and half the vanilla mentioned in the cake . Plus frost with whipped cream and pineapple chunks and bit of pineapple essence . Hi Khushboo…… Will b making this cake in a day..I want to make a fresh pineapple gateaux…… So what all should b added for that matter. if am not wrong..the more you mix or whipr the batter the more fluffy your cake gets..but u have mentioned dont mix more then 30 seconds…please let my conception clear regarding this..
YAY to the sweet success. Hope you enjoyed it . Thank you for a kind feedback Supriya. I know am reiterating what was said below but this recipe IS THE BEST! I have been trying to bake a decent eggless cake for almost two years now and today was my first success! The cake is still cooling so I shall share it later but I am just so happy that I had to comment right away! Thank you for your lovely feedback Shilpa . I am so happy that you are loving them. Keep making, keep sharing,hugs! Hi Dear khushboo, since long I wanted to tell -your cake s are ultimate,out of world! All my frenz, cousins loved! And distributed some cakes for NGO -all just loved it! Thanks Dear!! Your all recipe I ve tried, it’s yum mouthwatering! Thanks khushboo good article with nice information?? Neha , demerara sugar is one kind of raw sugar and definitely can be used for this recipe. I use it too . I even use turbinado sugar too many a times. Hey Seems thank you for stopping by. I would love to credit the creator so I just saw her recipe online and it doesn’t match .The measures are different . The recipe in my folder has butter and maida and I am still looking to credit the original. I have tweaked the original recipe to suit to my preference and happy that it works great. haha Megha such an interesting question. I get queries for flatter looking cake and cupcakes. People ask me how they can get flat tops so that they can frost well. And here your query is absolutely opposite . I love domed tops too . So here is a trick , just fill cupcake liners a bit more than 3/4 full and not half way.. you will get domed cuppies . Generally domed ones are done for muffins.let me know if it helped. I am glad you loved them. I agree with you – waiting is hard .. I love my warm cuppies with a scoop of ice cream too. Thanks for stopping by Pooja and trying a recipe too. The chocolate center sounds wonderful! Glad Hamsi you liked it. Sure , more coming soon! Stumbled upon on your blog when I was searching for a a good recipe of eggless vanilla cupcakes.. And what a wonderful blog you have here!! Just finished baking these cupcakes and needless to say these are an instant hit with my kids and their friends and the first batch vanished in under a minute ? I replaced oil with melted butter at room temperature and added few chocolate pieces at the center while scooping the batter into the mounds and it’s divine!!!! Thank you khushboo for the wonderful recipe and all the fine details you’ve written with such patience. Keep blogging.. Cheers ? Yay Amrita , rainbow cupcakes sounds fun. Would love to see the pictures. You can message them on my facebook page. Thank you for a lovely feedback. Gemma , anywhere from 30 – 35 minutes . Hi! Just wondering how long to cook this recipe if I wanted to make it in an 8 inch pan? Have tried ur dosa recipe nd chocolate cake recipe.. Both have turned out awesome.. Ur chocolate cake recipe is my fav. With easy steps nd detailed explanation ..
Gonna make a vanilla cake from ur above recipe.. I just need to know whether I need to make any changes in ingredients nd what is time reqd for cake to get ready?? The cupcakes look amazing! Just going to make a cake out of this. Can you tell me what size cake will the batter make and about how high? A big shout of thanks to you khusboo..such wonderful and easy recepies ..its been a week and i have been baking daily.I am in love withthem..being a vegetarian myself all this is a jackpot for me…couldnot wait to eat it and all of them were soo good moist and yum..cand even explain the feeling..cant thank you enough…. goodluck with everything you do…..
No you cannot , as it will change the balance between dry and wet ingredients. I would suggest rather follow a recipe that uses condensed milk itself . Could I replace the sugar with condensed milk? did you do the toothpick test Rucha , was it cooked ? Thanks for a lovely feedback Annie . I can only imagine how refreshing the taste would be with the ad ons you have mentioned, lovely. These were spot on! Perfect the next day i made mine with rosewater and chopped pistachio. But all in all perfect! Thats wonderful ! Thanks so much for such a prompt reply ! Will send you pics once its all done ! Owe you big time !! Thank you. Yes they freeze beautifully. Wrap individual cupcakes in saran wrap/cling wrap and store in airtight container in freezer upto 3 months. Thaw over the counter for 30 minutes. Then open the wrap, decorate or not. Enjoy! Rucha , it’s not related to sifting , sticky top is not an issue as such, it means your cupcakes are moist from inside , however there are other reasons too – did you cool them on a cooling rack? Is it very humid where you stay? Sure Lavina , I will be again baking them next month and I will update the measures then. Hi khushboo, love your recipes. Would you please be so kind to share this recipe in grams please? I tried this recipe yesterday . However, it turned out to be really sticky.what could be the reason. I had sieved the maida before using. I did look up online. It’s just that I could trust your word more. Thanks anyways ? How will the time of baking differ if I us a mini muffin pan? Welcome Sonal, thanks for a lovely feedback. Hello Khushboo, tried ur cake recipe. Everybody in my family loved it. Thanks for sharing awesome recipe. Hi Khushboo! Have been an ardent follower of ur posts in the food forums. Was searching for a good vanilla cake recipe n decided to look up ur blog. These look lovely! I’m gonna try ur recipe. Pls tell me how many eggs would be required to replace curd in this recipe. And is there any other change too that I need to make? Yes you can , bake as you would bake other cakes in microwave, you need to figure out the timings according to your microwave watts . Can we make vanilla cake, chocolate cake, red velvet cake in microwave on micro mode?? Happy to know that this recipe worked for you as well . Did you prepare your pan , coated with oil, dusted and lined ? I made your cup cake recipie,it came out very well . Sticky top is a good thing , it means your cake is moist from inside and not dry 🙂 , sometimes it’s because of humidity too. Doesn’t matter as it will be covered with frosting . Hope this reply helped . so baked a trial cake yesterday…followed the recipe tk thw T…the cake turned out well and baked fine…but.. I haven’t noted this recipe in grams , but I can say it’s a forgiving recipe , dry cups will work . Just eyeball the liquid , it should be a thick batter. i have dry cups only. can i use dry cups for both i.e. dry and wet both? and for dry stuff i should use the bigger cup (as i have set of four cups)? is there any quantity in grams? I did not understand sneha , can you please elaborate . mentioned in my chocolate cupcake post in details. Wet measuring cup for liquids and dry measuring cups for dry ones. what type of cup should i use for measuring flour n rest stuff? hey what size of cup should i use? sour cream will make cake taste very sour . You can use 50 :50 sour cream : yogurt – store bought is perfect . Great, one last question can I use full fat sour cream instead of yogurt? I don’t make yogurt/curd at home but I can always buy some from store, would that work? Thank you for your quick reply. I am super excited to try your recipe. yes it is sturdy , you can treat it as other cake sponges, in fact I have carved a doll cake once using this recipe. I refrigerate or freeze sponge before working with it. Ganached and fondant covered cake sit pretty well on room temperature for 3 days unless you have a perishable filling. Hey Khushbu, this recipe sounds yum and perfect. A quick question for you. For how long can I keep this cake outside covered in chocolate ganache and fondant. Also if this cake is sturdy enough to take the fondant’s weight? Please let me know asap I have this order on wednesday. Thanks !! many – cupcakes are made with cake flour or apf , much lighter and fluffier and they are frosted . Muffins are healthy and uses thick batter, healthy flours,toppings are healthy too ,are dense and finished with a crunchy top , not frosted hence breakfast friendly . They are less sugary , can be made savory too. That’s a good idea,but my family, neighbours and tution kids enjoyed them like that. Glad to know that Deeksha , you can make your own variations to the cupcakes by adding choco chips , cookie bits , fruits etc to make it more exciting . Hi Khushboo….today baked Vanilla cupcakes.I m not a big fan of Vanilla flavour,but these cupcakes were just awesome, They rose beautifully, lovely colour and ….they were just superb. Will post pic soon.Thanks for teaching. I do have couple of healthy cakes posted especially for kids. Do give them a try. You can replace apf in above recipes with wheat or multi grain flour and not completely with oats, just a part of it . The result will be a bit dense but tastes absolutely delicious. You will need to increase liquids by 2-3 tablespoons for wheat flour. Was wondering is i can replace the apf to oats flour in these recipes (even in the chocolate cupcakes). I m ok with this particular recipe…but i prefer cooking with the healthier option of wheat flour or oats for the kids. If u can help me with this. nice to hear that Sangeeta 🙂 I am so happy! Awesome simple eggless vanilla cc recipe! Thoroughly satisfied in my search for the best vanilla cc recipe ! Can i use vinegar instead of yogurt and in that case should i use flax seed powder to get possible results? Best ever cupcake I tasted today. Thanks a ton!! Thank you Anitha for a wonderful feedback , do share your pictures on my facebook page. Anitha use the white one. Heyjust wanted to ask before starting baking if the results would be same if i blend the curd sugar mix without any blender,I mean if i use only my hands to mix them properly? I see that u have mentioned cornflour or corn starch. Isn’t the both different ones? Corn flour s somewhat yellow n corn starch is pure white. Which one should I use? I have the huge cooking range oven , every oven is different , next time try switching off top element. Your cakes will soften on top once cooled . And try checking it 2-3 minutes earlier than previous try for doneness. But I would love to have a brown top, actual vanilla cakes have a lovely brown top. Taste was amazing perfect sweetness just one query it was brown from top which in turn made it hard from the top.. I have morphy Richards 60 ltr oven.. Do I need to switch off d top rod while baking?? Your cupcakes look so pretty white in Color..
Hii… I want to know can i add tutti fruity in this vanilla batter ? Hi Khushboo…. Tried your vanilla cupcake recipe…. Turned out awesome…I have been using your chocolate cake recipe all this while…. I loved the texture of these cuppies… Could we use this to make chocolate cake…. What do you suggest? Yaa I know… And I tried your chocolate cake recipe in that mould. So it took much longer to cook and centre was uncooked. So I romoved the rack and just placed it on glass plate for 10 min… Any other thing I can use instead of stick… Sorry to bother you…but I really trust your words and your recipe. BTW chocolate cake was yummy. will you be using doll tin? Thankyou soo much for the recipe. im sure gonna try it. just a question can I substitute butter/oil with dalda or vegetable fat? Hi Khusboo, I am planning to core it as I want to serve the cuppies in the wrappers itself ! Thank you so much once again for being so prompt in your replies !! hi ambika, yes you can use melted butter and at the same time . For boston cream pies I suggest go with all purpose flour in total . replace cornflour with apf . This will give you much sturdy batter for filling in the custard . Are you going to core it or slice it? I tried this in d morning n hands down this is the best best best eggless vanilla cupcake recepie ever. Thank u sooo much! N d way u have cleared doubts as to why u used where!! thanks fareen , yes you can skip it , I had it so used it , it imarts a buttery flavor . You can even do half oil and half melted butter combination. Hey khushboo.. Yet to try out yo recipe BT must say it luks amazing.. Wat s butter essence??? Wats it replacement?? Or can v skip it??? thats awesome Bhumika glad you loved it . Will eagerly wait to see your creation next time . Keep baking keep rocking. Hugs. Hey khushboo made vanilla cake yesterday .,.. OMG it was amazing … Out of the world … I so loved it … Can’t thank u enough for sharing such good no fail recipes of urs … Sorry not having pic but gonna make soon again and will surely share pic as well ,..
Thats kind of you . Thank you. love everything you post. Thanks a lot.